As many of you will no doubt have gleaned, I recently moved to London. In the spirit of new places and exciting adventures, I've decided to start a new section of my blog, The Culture Diary. I've no doubt that a larger proportion of my earnings will be going on the many exciting creative events that the city has to offer. I hope that this will be a space where I can spread the word about great events and venues around London. As a newbie to many of London's cinemas, I was delighted to find this gem was only a short stroll from my office (the nearest tube station is Green Park). With a bar where alcoholic beverages can be purchased, alongside a variety of the usual cinema snacks, the low-lit cinema had an immediately welcoming feel. Having received its World Premier a few days before, I was lucky enough to be among the first to see this astonishing new film from director James Kent, ahead of its general release in January 2015. 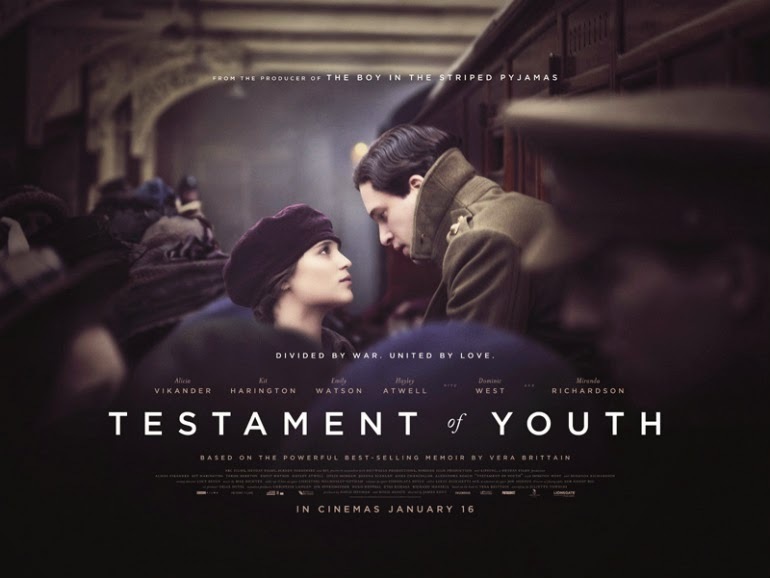 Adapted from the widely acclaimed WW1 memoir by Vera Brittain (which you can buy here: Testament of Youth ) the film was a directorial triumph, and the end result is a picture which is nuanced, difficult and incredibly moving. The film charts a period in the life of Vera Brittain (Alicia Vikander), in the months before the First World War as she secured a place at Oxford despite her Father's reluctance, to her relationship with her brother's friend Roland Leighton (Kit Harington), to the outbreak of war, and her work as nurse at home and abroad. Opening on Armistice Day, we see a solemn faced Vera making her way through the crowds to the relative calm of a nearby church. From the outset, Vikander's movement and expression conveyed so much about the depth of her suffering and her performance was utterly absorbing. As she gazes on a painting in the church, the audience is taken back to days before the war when she swam in the river near her home, laughing along with her brother Edward (Taron Egerton) and their friend Victor (Colin Morgan). I booked tickets to this film telling A that he'd find it a very 'Kate' film. I enjoy historical dramas, with a particular fondness for war films. As it turns out, it was even better than I expected it to be. The cinematography was simply stunning and there was a reserved quality to the film making which brought home the weight of the subject matter without the use of melodrama; the slow drawn out shots of injured men at the front alongside the echoing shots of Buxton countryside where the youngsters once walked are prime examples of this. The relationships between characters were nuanced and well played by the talented cast. Harington, Egerton and Morgan played off Vikander in scenes which were by turns tender and devastating. I left the cinema feeling emotionally drained, but moved by the beauty of this well-crafted film. I had the sense that it did Vera Brittain justice. An intimate epic, "Testament of Youth" has great historical sweep yet remains focused on the human vicissitudes experienced by Vera and her circle.